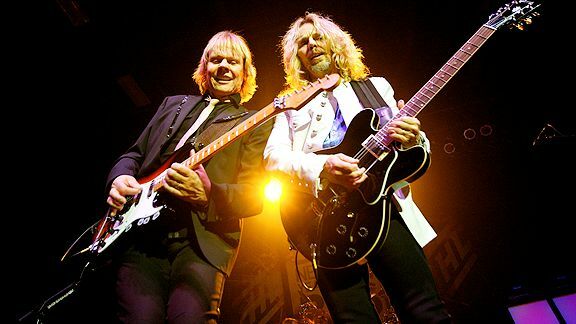 Mike Stobe/Getty Images James Young and Tommy Shaw perform more than 100 shows a year as members of the band Styx. If James "J.Y." Young would have cut his long hair in the late 1960s while competing as a swimmer, he might not have been one of the founders of legendary rock band Styx. Young was a student at the Illinois Institute of Technology, working toward a degree in mechanical and aerospace engineering. And he loved the sport of swimming, where he could compete on an individual level. "I was swimming long distance and my coach told me to cut my hair so that I would be able to swim faster," said Young, the 61-year-old Chicago native. "I had never even thought about doing that. I decided to give it up and focus on the guitar. I finally cut my hair in 2002." Even with that bachelor's degree at ITT, Young -- who had been playing keyboard and piano since the age of 5 -- gave up the business world to focus on music. He decided to join TW4, which later became the first incarnation of Styx. Now, 40 years later, the band is still going strong, working about 100 shows a year while on the road 200 days. Known for its hits "Lady," "Babe" and "Mr. Roboto," the band in its various incarnations is just like a team, Young said. "It's just like in football or baseball. We're a conquering army when we're on the road and we come into your town," Young said. "You go in there and try to win over the fans. Even if we get behind in the first quarter, we're going to come back strong." And Young does something to motivate his "teammates" to start each show. "I always walk out, take center stage and point to the back of the crowd. It's like Babe Ruth hitting that infamous home run after pointing to the bleachers," Young said. "If you're supremely confident like we are, you take the stage looking to hit that home run every night."